I have bought this bike with 8K miles about 2 month ago, I have replaced leaking oil sender sensor and resealed leaking crankshaft position sensor, but now after riding in a bit of rain for 10 minutes I noticed the speedometer jumping rapidly from 0 to 90 mi/hr. At this point the "Service!" message and red triangle are on, and I can't seem to enter any other menus to look up failure codes on the dash except for heated grips. Is this normal not to be able to enter system menu with "Service!" message on. All ideas on what is going on with teh menu or speedometer are welcome. Didn't the 09's come with a flakey(when wet) wheel speed sensor? If so, it can be dried out and sealed.. I'm sure someone with more knowledge of the subject will be around soon. I've heard defective plug wires will make the dash go nutty also. I would try the turn off, wait, and then turn key back on to see it it clears. Are you broken down on the road? Red warning light on, eh? Welcome to the club!! The red warning light has been coming on and off intermittently for close to three years on my "07 Norge. Still runs without a hiccup, however! 08 Norge. Service light came on yesterday when I started it up. I rode for about a mile and a half and stopped the bike. When I started it up the light was out. This is the second time. Once about this time last year, same thing. 09 Stelvio - Service message and Red triangle are on...Vlad. On my '12 Stelvio the Service Interval Icon (a small wrench image on the screen) appears every 6000 miles, since that is the recommended service interval. I can remove it by toggling through the screens with the left Control Button to the "Menu" screen. There is no science to this, sometimes it is a real PITA, I just have to keep trying. From the "Menu" screen I go to "Diagnostics". I input my code -- frequently it is "10695". Then I go to "Remove Service Interval", toggle to "Yes" and remove it. I caution you here. Your '09 is the earlier model, my '12 is the later model. 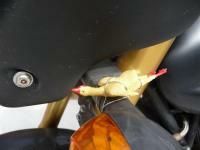 There may be differences in how to handle this change on your model bike. Last, I have no knowledge of how to handle the Red Triangle. Sorry. My 09 and many others did this. The rain water gets into the speed sensor and kills it. You may be able to dry it out and seal it. Or just replace it. They were upgraded in about 2010 and the new ones are good. My '09 did exactly the same. Speedo goes nuts, red triangle comes on and scares me half to death ... find out that's what happens when the speedo sensor on the back wheel gets wet, no harm to ride it like that. Take speedo sensor off, dry it out good, seal it up with silicone to prevent water incursion down where the wire goes into the box, buy another one for $70 in case your fixed one fails again, new one still sitting on the shelf 3 years later .... ! Thank you all for the input. I will start addressing the speedo sensor. Is the idea that the "Service!" message and the red triangle go away once the speedo is sorted out? Yes, the service message and red triangle pop up when the dashboard realizes that you are in gear, clutch out, high revs, but zero speed. I first thought that, but then realized that the speedo sensor is detecting rear wheel revolutions, so a burnout wouldn't spook the dash. Well, the problem was almost with speedometer sensor. As suggested here and elsewhere the wires/connector under the seat leading to the speedo sensor had bent pins, once pins were straightened out and reconnected, the "Service!" message disappeared. I had the speedo sensor sealed anyway as suggested. Have to love this forum, has helped me more than a few times. Even donated. Yes, 100% same issue, 4 hour ride in the rain yesterday and now after a good cleaning, red light, no MPH. So where is the sensor? Rear wheel on the 09. You will see the wire tied to the rear brake line. Yes, took the rear wheel off and thought I could open the sensor and use a blow drier but seems sealed. I can see where water gets in by the wire leading into the box. I will just have patience and wait a few days and see if all ok then will apply sealant around the wire. So when is all dry, the red light and service alert does not show? Or do I have to put the tire back on and spin it so the sensor responds before the dashboard resets?